I had to give you part two, didn’t I? Be on the lookout for part 3!!! 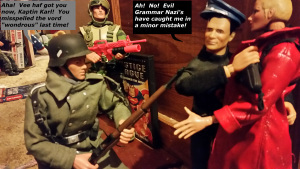 In the last episode of Expelling Evil, Grammar Nazis, we saw the Captain Action Hero-Action-Guy Team move into Mickey’s Library with the speed of a Republican in Congress when there is legislation to be passed. The heroes were prepared to battle Dr. Evil and evil Dr. Evil’s evil minions. 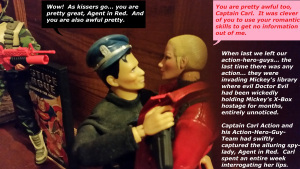 Captain Carl Action had encountered and pacified the evil minion known as the Agent in Red. He found ways to capture and interrogate her that, while not the least bit effective, were something that he really, really enjoyed. So Carl, taking his time… an entire week if you can believe it! decided to extend his interrogation even longer, in spite of chapped lips and the total absence of lip balm. It was then that Colonel Komma and his evil Grammar Nazis decided to move in and attack the foolish hero-guy with Blitzkrieg word war.